The P19 from Skreddy Pedals is definitely one of the most talked about Big Muff clones out there. No wonder really as Marc Alhfs knows a thing or two about Big Muffs. I’ve had my eyes on one for some time and I finally got the chance to try it out. Hereâ€™s my review. I did a review of the Pink Flesh a few years back. I wasnâ€™t overly happy with it and found the pedal just a bit too wild for my taste. Still a lot of people loved it. So much in fact that when it was taken out of production the prices on Ebay skyrocketed. Itâ€™s always been Skreddyâ€™s philosophy to never produce a pedal longer than a few years. Part of the reason is that some of the pedals featured hard to get parts but itâ€™s also because tone is constantly evolving. Once a new tone is discovered itâ€™s time to move on. A refreshing way of doing business if you ask me. Back in the early days of pedal making guitarists and engineers created effects and pedals based on a vision and an idea of what they considered to be the ultimate tone. This philosophy is very much the essence of the P19. The P19 feature true bypass switching and runs on 9V battery or Boss-style adapter all housed in an MXR style chassis. In addition to the familiar tone, gain and volume controls, there is a mini toggle switch switching between flat uncolored tone and a mild mids hump. The circuit goes all the way back to the Mayo and Pink Flesh. It is not a P1 nor a ramâ€™s head clone, as one might think but rather an attempt at capturing Davidâ€™s Wall lead tone as you hear it coming out of your hi-fi. It doesnâ€™t really matter that Comfortably Numb was recorded with a Strat, ramâ€™s head Muff and Hiwatt. That tone alone sounds very different to the signal coming from a close micâ€™d cabinet with post compression, limiting and who knows what. This means that the P19, compared to other ramâ€™s heads, has a considerably darker tone with less top, more mids and compression. Very similar to what you get when placing an SM57 slightly off axis on a loud tube amp. The pedal also has less low end, which maintains a clarity and focus that many other ramâ€™s heads are lacking. Itâ€™s hard to compare it with a specific model but of all the Big Muffs Iâ€™ve tried I would perhaps place it somewhere between an Electronic Orange Pig Hoof and a Cornish P2. Switching on the mids boost with the mini toggle adds a very mild boost that comes especially handy on brighter amps and bedroom setups. It’s subtle but you get a bit smoother tone and that feeling of tubes and speakers being pushed really hard. Still, for those Wall tones I think the flat position suits the pedal best. But the P19 is not just another David Gilmour Big Muff. Combined with humbuckers the pedal becomes a nasty beast that nails those evil riffs from Black Sabbath, QotSA and Black Label Society. Or, roll off the gain for some sweet Santana and Eric Johnson-ish fuzz. Itâ€™s nearly impossible to dial in a bad tone with this one. Its dark and creamy mid range boosted character eliminates the sometimes harsh overtones and the sustain sings forever even on low volume. Personally I prefer a bit more top and just a bit less mid range. I think that would have suited a Wall-ish pedal better and made it easier to achieve that crisp attack and slightly hollow sounding tone. Still, pairing up the P19 with a booster or EQ will take care of what you might be missing. My favourite setting is just everything slightly above noon paired with a Mistress and some delay. It takes you right back to Earlâ€™s Court 1980! The P19 sounds silky smooth with singing sustain perfect for What Shall We Do Now, Mother etc. Increasing the volume to around 3:00 pushes the amp for more compression and a darker tone. Very close to that heavy limiting you hear on the album and Comfortably Numb in particular. The P19 is one of the best Muff models Iâ€™ve tried on smaller amps and your typical bedroom setups. It stands perfectly well on its own and youâ€™ll have no problem dialing in a fat tone with lots of clarity and sustain even at the very lowest volume levels. Be careful with adding too much boost and compression as the pedal already has plenty of this. So whatâ€™s the verdict? I think Skreddy has managed to make a Big Muff with a unique tone and if David Gilmourâ€™s Wall tones was the goal, then the pedal is spot on. As I said I prefer a bit more top and mids scoop but the sustain on this thing is hard to beat. If you prefer a bit more hair on your Muff (oh… that doesn’t sound right…) then you might want to look elsewhere. If warm and smooth sustain is your desire then look no further! Check out skreddypedals.com for more info and ordering and see Big Muff guru Kit Raeâ€™s review as well for more tone comparisons. Your passion and efforts with this site are so greatly appreciated; thanks for all you do on our behalf. My son just purchased a cica 2014 P19 pedal. I must say I was really surprised how good it is. Versatile, and usable at all volumes, stacks really well…especially with a rangemaster style boost and a compressor into it, but very good on its own. I agree it hard to get a sound that you can’t use with it, easy to lost fiddling with the settings. Took the place of a Wampler Velvet fuzz (nothing wrong with that pedal either! Just a bit too contrived sounding for my taste) on my board, running into the front of a nice old Fender Twin Reverb. Thanks again, please keep up the good work! Awesome sound …. what is the settings of your L20H amplifier that you are using in this demo? Hi Alfredo! I’m mostly using these settings: gain channel, bright, drive 2, volume as desired, bass noon, mids noon (full for stage use), treble off, tone off. Great site! Just a correction for you: the Comfortably Numb solos were recorded with a Les Paul with P90’s into a Plexi Marshall miced with a Coles 4038 ribbon mic. The console eq (a big component) was from a Quad Eight console. Source please? That would be a massive revelation. Both David and Phil Taylor has always said that the solo was recorded with the standard setup for the sessions: the Black Strat into a ram’s head Muff and a split between a Hiwatt and Yamaha RA200. I can’t see why that isn’t true nor do I hear anything that suggest otherwise. Hello Bjorn – I really like your site, and have enjoyed the sound clips and incredible info you’ve collected. I saw this clip of DG playing a 55 Les Paul with p-90’s, and he mentions that it was the guitar that he used for the solo in “Another Brick…” – about 2:58 from the end. Thanks for your kind words! Indeed, the solo was recorded with the LP. Read more here. Yeah….ok. The problem with that theory would be Gilmour has never stated that. Ever. I just picked up a Skreddy P19, Mooer eleclady, and a Duncan SSL-5 (Can I have the GIlmour tone combo meal #4, please!â€”Ha!). Your excellent reviews and demos were extremely helpful (I particularly loved your P19 video demo! Awesome tones and playing!). Although I havenâ€™t yet installed the SSL-5 into my Strat, I was able to spend some time with the new pedals into a couple different amps. I got a sense that the tones are definitely in there, but for the Muff tones to be closest, it requires having a basic amp sound that is fairly open with an extended top end for the fuzzy/reedy quality of the Muff to shine through. If the amp is too dark or rounded off at the top end, the Muff sounds too smooth and more like a regular overdrive. Is this correct in your experience or am I off track here? Any thoughts on how best to dial the amp to get the tones like you did in your P19 demo video? I have a few good choices for ampsâ€¦ a Dumble style, a Plexi style (lead spec), a Blackface Fender, and some Mesa/Boogies (Lone Star, Mk IV, Dual Rec). No HiWatts unfortunately. Hi Matt! As mentioned in the review, the P19 is designed to capture the tone David Gilmour got from stacking his ram’s head Big Muff with a Colorsound Powerboost. The tone was saturated, compressed and, paired with his Hiwatts, he also got a nice mid range. On your Dumble and Plexi, that might be just too much mids and compression and, as you describe, the pedal might sound too dark and lack some of the harmonics in the top end. Try rolling down the mids on those amps and leave the P19 in the flat position. I’ve had great success with Muffs on the Dual Rectifier in particular. Although fairly scooped, its clean channel with a bit of mids boost, will go nicely with the P19… that’s my experience anyway. 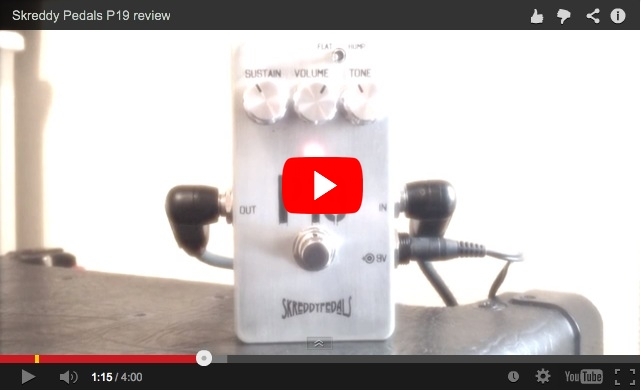 Hi Bjorn, Back in December 2013,one of your members was getting excited about a V2 pedal. Would this be the Vick Audio V2 he mentioned. I don’t know if it is intentional or not but the … at the end is hilarious as most people who frequent your site knows who you are referring too. Hope he pops in. Long time lurker on your site, thank you for all the great information and reviews! So I haven’t really started down the big muff road, but I do want to invest in a new one so I can get those gilmourish solo toanz :) If I have a rockett blue note and keeley bd2 at my disposal, I was wondering if you would suggest just getting a Rams head clone like the SUF violet menace and pairing it with a booster or just getting something like the p19. I’m playing a CS 60’s strat through a Mesa boogie dc-10. I’m not the type to start a large collection, just want something to get me 90% there. Thanks! I think the P19 would work nicely with the Mesa. You’d need a Muff that’s not too scooped so, while a Ram’s Head might get a bit fizzy on the Mesa, the P19 or a Sovtek clone would do nicely. Bjorn, Cheers again from the states! I Have the Laney Lionheart LT5 that we spoke earlier of. I had the muskett fuzz before. I ran it through a VHT Special 6U. Form some reason it sounded kind of flat although it was versatile with all the controls. I couldnt quite get that comfortably numb type sound. I am a novice and play for fun. since I have a Lt5 now. What pedal would you suggest that will be the most versatile for wall / DSoM/ type sounds. I know its subjective. The Lt5 has so much more personality than the VHT. Very clear and crisp. I was looking at the P19 , The Dover Drive, The Iron Bell, or trying the Muskett again. If you could have one that seems to do a lil bit of everything what would you recommend. Im also into the srv hendrix zzz top stuff. But I find myself really into Davids sound and approach to music. I tried to contain myself, but that last post, and reply made it too hard. As for the Musket, P19 question, you said instant Animals, and Wall for the P-19. When I said that,( now feeling vindicated because of things posted about the pedal), about the V2, I was chastised by a reader here, saying,” there’s no such thing, you’re just prejudiced about the pedal.). So, my point is, the V2, is also instant Animals, and Wall, for an extremely reasonable Â£169! I wish this guy in Norway would review it, and second my opinion that you won’t find a better Violet Ram’s Head clone, at any price!! Peace, Keith :) I couldn’t help it!! Hate to bother you but would you recommend the Black Musket or the P19 for me. I am building a Warmoth strat with swap ash, DAllen echoes and will play through a Laney 12R with reeves vintage purples for bedroom and a Fender Bassman 59 reissue for band. I like versatility but the sweet violin like sustain of the Muff is more interesting than the grainy lower ends to me. If it sounds anything like the wall I will be amazed. I noticed you got a really fantastic, sharp sound when you stacked the P19 with the Power Booster (and, of course, the mistress and rotary ensemble) at about 1:30 minutes into your video. I was just wondering what kind of settings (roughly) do you use on the booster to get that crisp, boosted sound? I checked your review of the Power Booster itself, but I think you were only demoing that on its own, and not stacked with a muff (not that it’s a bad sounding pedal on its own, by any stretch of the imagination!). Thanks in advance, and keep up the fantastic work. Great clip Bjorn. I have the P19 and love it. Just got the Buffalo FX Power Booster and love that too! What were your approximate settings on the Power Booster in combo with the P19 for this demo? Thanks for sharing all your hard work! What are your thoughts on the Wren and Cuff Caprid? Thanks for your advice on the P19. I was about to start saving for it when I made a mistake and watched you Buffalo Patriot review. What a massive sound. Your choice of song and the skill that you played it certainly does the pedal justice. Would the P19 get close to that huge tone or should I just save up another $75 and go for the Patriot. Am I also a bit optimistic to expect my Cub12 to be up to the task? Great playing, a pleasure to listen to. Hey, I’ve been following your Gilmour site for quite awhile and trust your advice. So, I try to read most of your comments, which is getting to be more like reading a novel (which is a good thing!). I have a chain question. My setup is a Strat with EMG’s=Diamond Compressor–Skreedy P19 fuzz–Rockbox Baby Blues overdrive/distortion–Buffalo FX power booster(just added)–Univibe–Chorus–Strymon delay & reverb=Reeves 50 combo with a purple vintage speaker. I just added the Buffalo power booster and would like to keep it on all the time. My question is, would you change up this order? I’ve been reading through some of your booster comments (Throbak, Colorsound, etc) and I’m not quite sure where the Buffalo power booster should go, and you might have some other thoughts on my chain also. Thanks again! Hi, I gave you my setup back a few weeks ago and went with your recommendation and got the Skreddy P19 fuzz pedal to get in the neighborhood of David’s “Gdansk” sounds. I couldn’t be happier, it sounds great, and I seem to have more control, without it getting too wild & fuzzy and going over the top and it will be a keeper staying on my board. At this point, when I have a diamond compressor, Skreedy 19, overdrive/distortion, univibe clone, chorus, strymon delay & reverb, are there any pedals you recommend to fill out my pedal board in the Gilmour/Pink Floyd genre (always seems we can find room for one more!). Thanks. Hi, Here is the additional information on my equipment for helping me to figure out what Muff to use to get into the neighborhood of David’s more recent sounds “On an Island” & “Gdansk”, etc. I have EMG active pickups in my Strat, my Reeves combo has the “Vintage Purple” speaker that comes standard with most of Reeves amps and I use a “Rockbox Baby Blues” pedal for all of my boost/overdrive. Thanks again for all that you do with your cool site, its one of a kind! Hi, I wanted to get your opinion on what you thought would be the best muff/fuzz pedal for David’s “On an Island” & “Live in Gdansk” sounds. I’ve figured out most of the pedals I have on my board that have very good sounds and will stay (diamond compressor, rockbox baby blues overdrive, black cat vibe, el capistan delay, etc), but I seem to have a much harder time with finding the right fit for a muff/fuzz. I’ve tried some pedals (Iron Bell, Top tone DG-2) which are both good pedals, but over time….they weren’t exactly what I was looking for. I play an 80’s strat through a Reeves 50 custom. I was thinking of a Skreedy P19, Lunar Module, Electronic Orange (except for their 9 month wait list), etc. next, but I though I would check first with you before I go down the rabbit hole. Thanks, great site! I’ve had this pedal for a couple of months now, (I got it about a week before you wrote this review), and it just KILLS!! My favorite go-to pedal, hands down. I’ve put in an order with Marc for his BC109 fuzz. If it’s half as good as I think it is, then it will be AWESOME! I dig the Skreddy products. Of course the first place I heard of them was here. Thanks for turning me on to Skreddy pedals. Another plug to please review the Catalainbread Manx Loaghtan! the 0001 start on a budget – new for 2014!!! shame about the stupid 2 point synchronised term – its would have been perfect otherwise!! Agree with the above. Im interested to see what rating you give this one. Bjorn, I know I told you I was experimenting trying to pair the P19 with my Tube Driver. In the end, I realized there just wasn’t a need… nor a compressor, limiter, etc. It just sits so great on its own. To all that are interested in this pedal – 2 points. I have not heard any soundclip that does the P19 justice (as of yet). You have to hear it to believe it. Also, if you really like the more modern Gilmour tones from Pulse, On An Island, this pedal is a godsend. All you have to do is literally max out the sustain (as long as you have the amp headroom) and boom, you are right there. As Bjorn shows in his clip, using it at lower sustains sounds great as well, mimicing various gains Gilmour used. He is very known for using lower gain on his albums and studio sessions (watch the AOL 2006 studio sessions on youtube), but then in big concerts letting the gain rip… like in Pulse and On an Island tours. If any of you own a Cornish SS-3, try stacking it with P19. I use my ss-3 more like a volume boost, with only about 15% sustain to cop Division Bell tones, but if you stack with the P19, the low end becomes awesome, reminiscent of the Sorrow intro from Pulse. And Im not using an EMGed guitar, just the vintage single coil setup. Bjorn, once again, thanks ! – We all appreciate the hard work you do on this site. It makes our guitar lives a bit easier in the end! – keep rockin! The big question is what Gilmourish rating do you give the P19? I haven’t seen it posted yet. Happy New Year! Hello Bjorn, thank you for the advise, i bought the TS808 and it relly gets those vintage tones, specially from he Division Bell era. But i got one problem, the only whay i could get the really crispy top on my practice/bedroom amp was by taking the tone from the ts808 to the max, i could’t realize why, but i noticed that my practice amp had the stock cheap chinesse tubes and my gig amp had some nice hand made tubes. So i went to the internet to look for some new cheap tubes but couldn’t find some good ones for my country. So i wanted to ask you if you know any cheap (but good) brand for tubes, something cheap from china or russia that could deliver some more top end (I would love to have the jj’s, but the shipping to my country(chile) cost a damn fortune!). Hi Bjorn, sorry for asking this on this page, but as it is the latest i thought that you would see it earlier, i wanted to ask you what do you think about the Ibanez TS808 (late reissue), i’ve been told that it is really warm and with a low gain character (wich is what i’m looking for), do you recomend it for a gilmourish tone as a clean boost/Od? so whatÂ´s the song on the intro in youre videos? Great Review. I’ve had this for over a year… how do you find it compared to the Mojo Hand’s Iron Bell or the Musket Fuzz? Would you be so kind as to offer me some advice on the placement of my new fulltone mini dÃ©jÃ vibe please? I don’t know where to put it in my chain to get the best gilmour sound. heard you nention that before, but it makes a huge difference. Can’t wait for tomorrow, gonna put it on the board, and see what happens with the Throbak, and a little modulation behind it. It’s a lovely beast, and I’ve only scratched the surface! Bjorn, the V2 has exceeded my expectations in every way. Even without boosting it’s so close to what I hear on Animals, it knocked me out! It’s a beast when the sustain is past about 2-3:00, unity is about 11:00, or so, frankly, I wasn’t? paying too much attention to the settings, because I was too busy lifting my jaw off the floor. I only had time to give it a quick run throuh, but I didn’t expect this kind of smooth sustain, yet much more gain to spare without a clean boost to smooth it out. Hey, I’m no Muff expert, but I have a good ear, and my ear screams the tones from Animals, and tberefore quite capable of the Wall, and with a good boost, I can only imagine. Stu has a definite hit on his hands with this V2. You’ve got to have one! The wah sounds great, unfortunately, something in tbe circuit is impeding the Seagull, it’s a squeal, with no laugh, or pitch change, it’s likely something simple, and he’ll figure it out, but the wah itself is very vocal, with a vreat sweep, a very vintage, early Thomas Organ Vox/Crybaby sound, perfect as a wah, gotta get the gull singing. Wonderful article/review & what a great site! It’s obvious that a lot of care and attention has been put into it! Many congratulations on such a fantastic achievement and all that dedication!! I was wondering how you would compare this to the Wampler Velvet Fuzz (which I know you have mixed feelings about, but thought I’d ask anyway) The Wampler VF is also supposed to deliver a ‘composite’ tone insofar as it tries to capture the combination of a fuzz (not sure what type, but let’s say a tonebender/Muff hybrid) slamming an EL34 equipped Non Master Volume Stack. Given that the P19 appears to be aiming for something similar, albiet a Muff -> Boost -> HiWatt as opposed to a Marshal (? ), I was wondering how they compared in your opinion. Hello Mr. Bjorn and fellow Floydians… don’t know if anyone has mentioned it yet, but Rolling Stone magazine has a special Pink Floyd collectors edition (titled: the ultimate guide to their music and legend) out at the moment. It’s kinda pricy at $11.99 U.S. dollars, but there are some pretty cool articles covering the bands evolution thru the years. Don’t know if it’s available in the Netherlands, but if you want a copy Bjorn, contact me and we can work it out. As for the piggy pig P19, I’ll stick with my SUF CivilWar. I do very much want a Skreddy PigMine though. I think it sounds alot better than the P19 IMHO. Cheers. Let me know if you want me to pick up a copy for you Bjorn. Brian. geneva.view@gmail.com. [Sorry for my late reply, James. The term “hot” is used to describe a pickup that has a higher output that the classic vintage ones, which has, compared to the more modern ones, a fairly low output. The number of wounds on the pickup determine the output (among other things) and how “hot” it is. A late 60s single coil has a fairly low output. It is clean and transparent with more high and low end than mids. A S Duncan SSL7, which is what David’s using as bridge pickup in his Black Strat, has a considerably higher output, which also means less top and more mid range. It doesn’t say that much about the actual tone, apart from the fact that high output usually means more mids. A hot pickup doesn’t distort by it self but it might make your amp break up sooner if it doesn’t have all that much headroom. 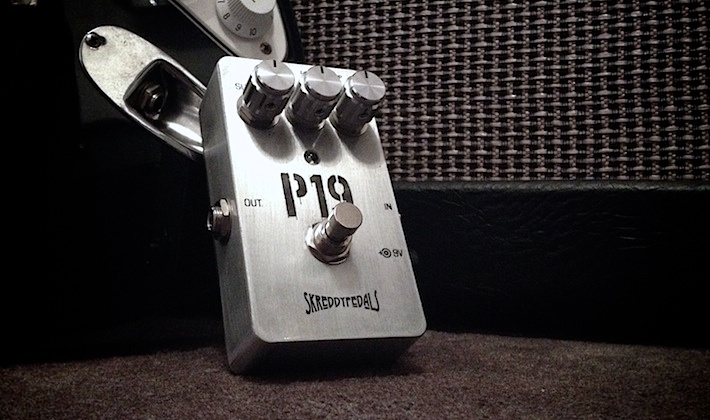 Awesome sounding pedal and if you mess around with the name P19 you get PIG hmmm, Marc IS a PF fan afterall. Thanks Bjorn for this great review, I guess tons of people will be happy to read it, given the reputation of Skreddy pedals. The Lunar Module is another Gilmour-related pedal by Skreddy, do you think you might be able to review it some day? Off topic, but Bjorn, but Iâ€™ve finally just about caught completely up on my supply house bills, and everything else I accrued when I had the 9 weeks off work due to the fall, tick bourne illness, etc. So, the V2 is on itâ€™s way, and Iâ€™m taking the day off to finally wire my board, and arrange my pedals on the â€œBig Blue Board â€ thatâ€™s 16Ã—36â€³, and with the top on, 7 1/2â€³ tall. Iâ€™m pretty confident in my chain now, and as soon as my oatch cables arrive, Iâ€™ll finally get you a great photo of my gear. The board has sat empty for over a year, and though Iâ€™ve had my amp back from REEVES, Retubed, and biased, with Mullards, for almost two months, I havenâ€™t even plugged it in yet. It may be okay with the Mullard RIs, but Iâ€™d rather have the JJ E34Ls, or the Ruby branded Shuguang EL34BHTs it was shipped with. However, the Mullards do get goid reviews, but evidently have more midrange, while supposedly keeping the focused liw, and high end. I’ve spent so much time reading, buying gear, and working, that I’ve sacrificed the little time I have when I can use the Reeves at home. Next month, when I move into the shop, I’ll be able to play at a high enough volume to get the most out of the REEVES, any time I want, instead of just two hours on Sunday morning. I’m so excited to get Uncle Ebbs rolling, and have a place to play loud enough to get the most from my Muff, and Vintage Fuzzes. Photos, and the V2 clip will be forthcoming, as will a clip of Stuarts great Wah, with the best Seagull mods I can think of, and wonder why no one thought about using the same switch to reverse the leads, and turn off the Seagull killing, fuzz friendly buffer before Stuart just said, “I’ll do this!”, anyway, time to solder, and velcro! Thank you Bjorn! Fender Stratocaster with CS69+SSL 5, Blues Junior III amp, Wampler Ego Compressor, Fulltone OCD, Maxon OD808, Deluxe Electric Mistress, MXR Analog Chorus, TRex Replica. Iâ€™m looking for a definitive muff Gilmour-all-era pedal for a bedroom setup: Blackout Musket, BYOC Large Beaver or Skreddy P19? Hey Bjorn Merry Christmas, glad to hear that you like the P19. I’m quite fond of it myself, I use it with a Skreddy Mini Deluxe Screwdriver. Have you gotten around to trying the Catalinbread Echorec yet? Also can I still email you at bjorn@gilmourish.com or is it that defunct? Very Nice!!! So happy that Marc got this out to you! Wow, sounds great for those Wall and Animals tones! Impressive. Thanks Bjorn! Nice review by the way. What Big Muff would you recommend for the animals album this pedal or the Wren and Cuff Tri Pie 70. Thank You. Your website deserves so much attention, it really is amazing what you’ve done. Yeah, I tuned the P19 using my Hiwatt Custom 100 and 2×12 Jackson cab with Celestions. Has a bit more bass and treble when played through my rig than what I hear through your Laney(?). For me the added mids in the P19 take it to the level I hear in the studio recordings. For you, there is a bit of “extra” midrange happening with the P19, so I can see why you’d prefer a stock BMP tone stack with the mid scoop for your rig. Great playing as usual; I especially like the extended Mother solo! be using my Thinline Tele, with Lindy’s steel pole P-90 style pickup for Teles, and it’s a pretty hot 10k bridge, and 8.5 neck, and everyone in his shop wanted a set and a thinkine after hearing what it did to my little Squier. Lundy even order a Alder Thinline body after he installed those pups! So, it should work well for the clip, although I may neex to crank back on the volume a little. WOW, Skreddy hit it out of the park with this pedal. It’s a keeper, and I bet it goes right on your board! Nice review Bjorn! You weren’t kidding when you said it was impossible to not get a good tone out of the P-19. I really enjoyed your Live Wall tones. What settings do you recomend for the RT-20? Thanks!